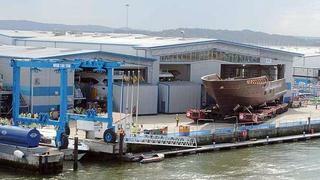 Sunseeker last week moved the completed hull of its first 155 Yacht to the fit-out shed within the Poole Quay facilities. The yard had to plan the operation carefully to account for the 47.2m yacht’s size, but the move went smoothly and the launch is due in 2014. Later in the build this yacht will also become the first Sunseeker to receive a fully-painted finish. For this reason a clear gel undercoat has been used in the hull construction – the resin showing through is what makes the hull appear brown. The flagship tri-deck yacht, which is being built for Formula One legend Eddie Jordan, will have a top speed of 26 knots and a 4,500 nautical mile range. She will accommodate 12 guests and 10 crewmembers, and feature inset ship's balconies, transverse garaging of tenders and toys, including a private beach club with lower deck dayroom, as well as a folding platform and tender docking.